A bathroom is one room in the home that is used every day but often gets little respect. Considering that the bathroom is one of the first spaces that you visit to start your day and one of the last places you visit to end your day, it should be designed to be comfortable, relaxing and very functional. If your bathroom is less than impressive and you want to update the look, feel and function of the room, a great place to start is with a custom designed bathroom vanity cabinet. 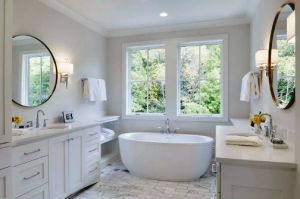 Danner’s Cabinet Shop, Inc. has the expertise and skills to design and build your dream bathroom design that can transform an ordinary space into a relaxing retreat. Check out any home improvement show, real estate program or homebuilders showcase at it will be abundantly clear that the bathroom is an important part of any home. Careful attention to detail can go a long way in creating a bathroom space that is very inviting, comfortable and functional all at the same time. Wouldn’t you love it if your bathrooms included the following features? Very Functional Layout that makes use of the available space perfectly. Relaxing Atmosphere in a spa-like sanctuary that allows you to get away from a busy day and take time for yourself. Stunning Design Elements that capture the unique style of your home. Beautiful Bathroom Vanity with innovative storage features that elegantly store objects where you want or need them to be. Style of the master bathroom in particular can set the theme for your day. Luxury in unexpected places can help you to begin and end your day more peacefully. The overall function of a master bath, guest bathroom or powder room is a top priority. It used to be that any old cabinet would do but not in todays busy world where everyone seems to be multitasking from sun up to sundown. Custom cabinetry can be designed with your individual style and have features that makes the vanity a multi-tasking genius. Not only is a hand crafted, real wood cabinet extremely durable, it can be designed to display, hide or store everything conveniently right where you want it. Danner’s Cabinet Shop, Inc. can provide you with a luxurious bathroom makeover at a cost that may be less than you think. It all begins with an elegantly designed bathroom vanity that is made to be the workhorse of the room. The enduring quality of real, custom wood cabinetry can last for generations. There is really no substitute for genuine custom made bathroom vanities and cabinets that are designed to function with your own personal style. Call Danner’s Cabinet Shop, Inc. at 763-753-4002 to see how we can help you to live the dream and escape from it all in your beautifully updated bathroom.